The small town of Solesmes is in the western region of the Sarthe department of north-west France, a short distance north-east of Sablé-sur-Sarthe. Solesmes is a traditional town of the region, pleasant to explore and with many buildings in the traditional local architectural style - low buildings in light colours and with slate roofs as well as the Church of Notre-Dame. There are attractive views along the Sarthe river from the bridge in the town, and the efforts made by Solesmes with its plants, gardens and flowers also add to its charm. In reality however it is because of its principal monument, the Abbey Saint-Pierre of Solesmes, that most visitors are attracted here. One of the most substantial benedictine abbeys in the world, the abbey at Solesmes is also very famous for its role in reviving Gregorian Chant throughout the Christian world. 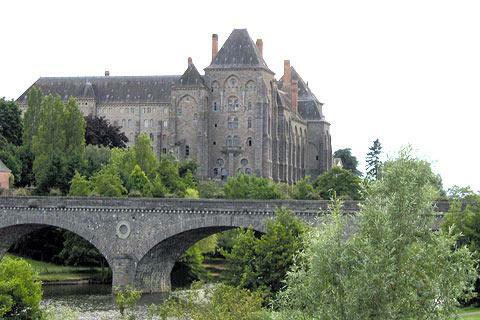 The abbey was originally founded in Solesmes in 1010 by Geoffroy de Sablé. After flourishing through the Middle Ages, and suffering various trials during the Hundred Years War and the Wars of Religion, it was with the French revolution at the end of the 18th century that the community of monks here came to en end. During the next 130 years the community was re-established in 1833 and again removed in 1880 and 1901. It was not until 1922 that the current community of monks was permitted to settle at Solesmes, where they have remained to the current date. It is the abbey church, dating from the 15th century, that is open to visitors and where you can appreciate the monks singing the gregorian chant. Note that because the abbey is still home to an active community of around 60 monks the remaining buildings are closed to the public. Remember that when you visit the abbey it is as a place of worship, not as a tourist attraction or a public concert, although members of the public of all religions and faith are welcomed. You can obtain more detailed visitor information at the Solesmes abbey website. One of the best overall views of the abbey can be had by crossing the Sarthe river in the town and following the road and footpath along the river banks a short distance to the right to the Port de Juigné - no need to drive it only takes a couple of minutes to walk. 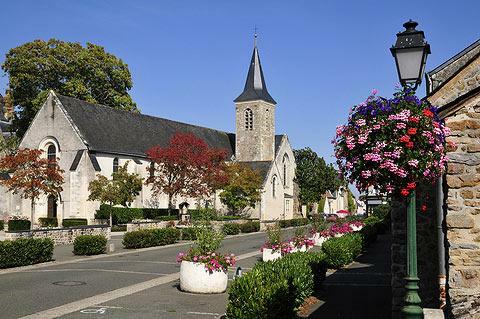 After exploring the town and abbey at Solesmes we suggest you travel a few kilometres to the north-east to visit the picturesque village at Asnieres-sur-Vegre.